Music by Stevie Wonder and other famous Steves (think Stevie Nicks, Stevie Ray Vaughn, Steven Tyler, Steve Wormwood, etc.) is expected to weave its way into the band’s own catalog for an unforgettable night of music. The Magic Beans offer support on the bill. Blending infectious funk grooves, psychedelic jams, and experimental electronics, the Baltimore four-piece’s latest album is a buoyant, blissful reminder of just how much fun music can be. Eschewing the traditional funk band lineup that typically includes keyboards, Pigeons Playing Ping Pong constructs effervescent soundscapes with just two guitars, bass, and drums, crafting their music with a sophisticated ear for both open space and dense layering. While the new album is certainly a “creative advancement” (Billboard) for the group, this band is known for their road-tested live performances. 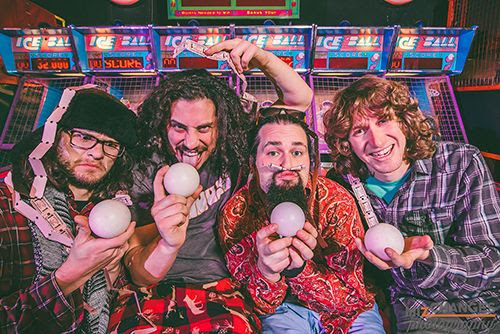 This summer alone, Pigeons Playing Ping Pong made debuts at Bonnaroo Music & Arts Festival, as well as Colorado’s legendary Red Rocks Amphitheatre to crowds in the thousands. Whether it be an original tune from one of their four records, an inventive cover of a song from the Disney catalog or an hour-long completely improvised set, there’s no saying what the quartet will bust out when they take the stage. 5/2 – Morrison, CO – Red Rocks Amphitheatre !